Sirius XM Radio's next broadcasting satellite rocketed away from Earth and into space Thursday, reaching a lofty perch high above Earth for a 15-year mission serving nearly 20 million subscribers in North America with music, news and variety programming. The company's ninth satellite lifted off at 1853 GMT (2:53 p.m. EDT) from pad 24 at the Baikonur Cosmodrome in Kazakhstan, the first commercial Proton rocket launch from that complex in more than five years. The Proton lofted the Sirius XM 5 payload on a suborbital trajectory in less than 10 minutes, then a Breeze M upper stage fired as planned, according to International Launch Services, the Russian-owned, U.S.-based firm responsible for commercial Proton sales. The upper stage fired four more times overnight to raise its altitude and reduce its inclination, eventually arriving in an elliptical transfer orbit stretching more than 22,200 miles from Earth at its furthest point. Deployment of Sirius XM 5 occurred at 0405 GMT (12:05 a.m. EDT) Wednesday, more than nine hours after liftoff. Thursday's launch was the ninth Proton flight of the year. 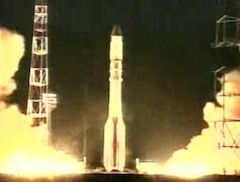 It was the sixth mission for International Launch Services. Sirius XM 5 will fire an on-board kick engine several times over the next few weeks to reach an orbit 22,300 miles above the equator. Controllers will park the satellite at 80 degrees west longitude for a month of in-orbit testing, then the craft will drift to its long-term home at 85.2 degrees west longitude. 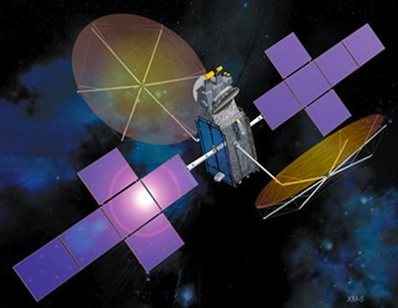 The satellite will be an orbital spare for the XM 3 and XM 4 satellites currently transmitting operational radio signals, according to Lincoln Day, executive director at Space Systems/Loral, the satellite's prime contractor. Sirius XM 5 will join a fleet of spacecraft already beaming radio signals to receivers in cars, trucks, boats, aircraft, homes and mobile devices of more than 19.8 million subscribers. "The successful launch of XM 5 bolsters our continuity of services and will help ensure Sirius XM Radio's audio and data services are reliably delivered to our customers," said David Frear, executive vice president and chief financial officer of Sirius XM Radio. "We knew we could count on ILS and Khrunichev to launch on-time and with flawless precision as they have been demonstrating for us for over a decade now." Two 29.5-foot-diameter unfurlable mesh antennas will broadcast Sirius XM Radio's 135 audio channels. The antennas will be connected to an S-band downlink and X-band uplink communications payload. The satellite is designed to last for at least 15 years in space. Based on Loral's 1300 spacecraft bus, Sirius XM 5 will produce nearly 20 kilowatts of power at the end of its mission. The rest of the company's broadcasting fleet was launched under the banner of Sirius Satellite Radio and XM Satellite Radio between 2000 and 2008, when the firms merged to form Sirius XM Radio. Another Proton launch delivered Sirius FM 5 to space in June 2009, deploying the company's newest satellite before Thursday's mission. "The relationship we have with Sirius XM Radio dates back to over 10 years with the launch of the Sirius constellation of three satellites in 2000," said Frank McKenna, president of ILS. "The entire team of ILS, Khrunichev, Sirius XM and Space Systems/Loral once again worked throughout the mission to deliver the XM 5 satellite to orbit. We thank Sirius XM for entrusting ILS Proton with their business and allowing us to participate in the making of satellite radio history." Sirius XM Radio plans to launch another satellite, Sirius FM 6, in late 2011 on a Proton rocket. The next Proton will deploy the SkyTerra 1 mobile communications satellite for LightSquared and Boeing. That mission is slated for liftoff Nov. 14.